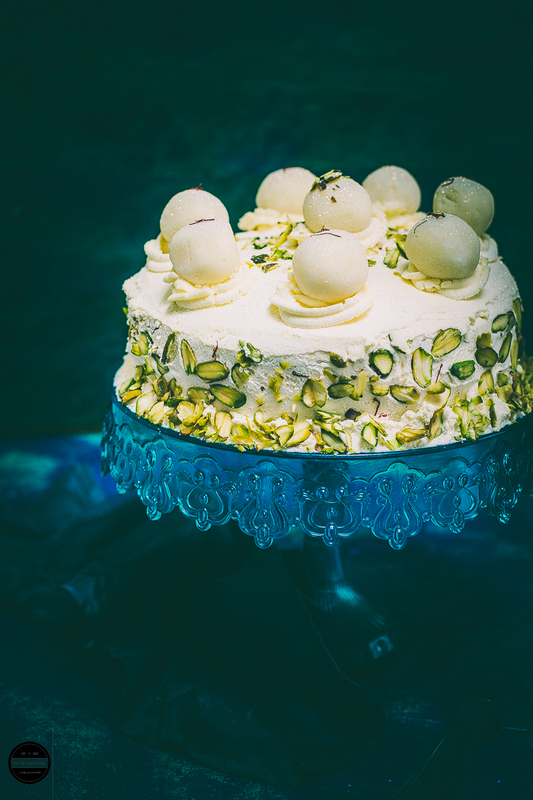 Eggless Ras Malai Cake, an interesting fusion layered cake that is exquisite and sumptuous! Make it for someone that you love, surely they will never forget it. 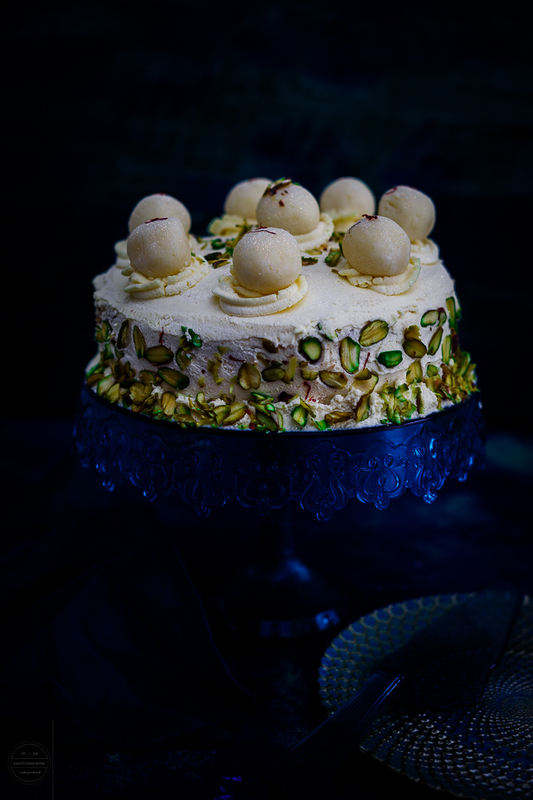 Eggless Ras malai Cake is the perfect treat and dessert for any happy occasion such as birthdays, get together or even Indian festivals, surely this cake will be a center of attention because this cake is glamorous! What is Ras Malai Cake? A fusion cake or dessert prepared with a basic western sponge cake and exotic traditional Indian ( Bengali ) sweet Ras Malai. In the word Ras malai, Ras translates as juice and Malai as 'Cream'! In this Ras Malai recipe, Indian Cottage Cheese (Paneer) balls are cooked and immersed in a creamy milky syrup which is flavoured with cardamom and saffron. The dessert or sweet Ras Malai itself is divine and once it is incorporated into sponge cake this dessert becomes an ultimate treat for those who have a sweet tooth. A few months back I saw these cake pictures posted by someone on social media and I was sold, instantly I thought of my daughter. Since Ras Malai (last time I prepared Ras malai on her birthday 7 years ago) is her one of the favourite Indian desserts, I wanted her to surprise her with this cake and I patiently waited for her birthday. Oh yes, I only bake a cake three times in a whole year. 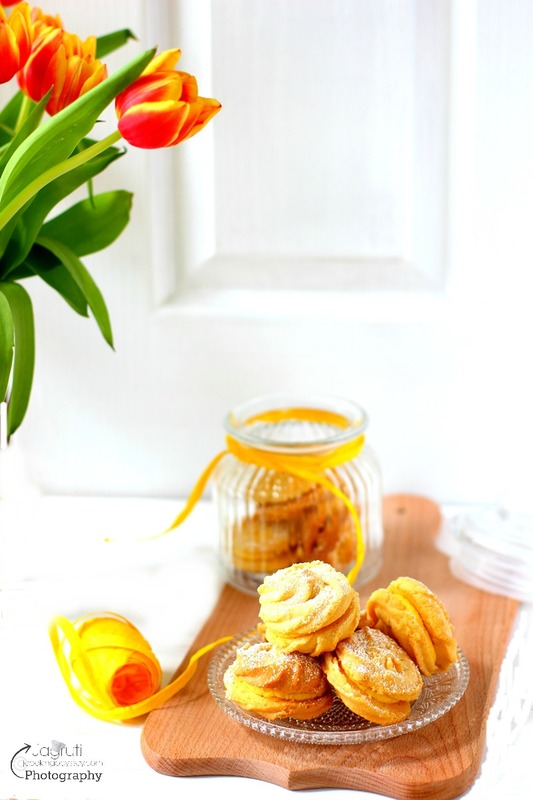 I stepped out of my comfort zone and try my hands on a new baking recipe for my loved ones. I don't know if I succeeded in making a show stopper cake but definitely taste wise I have always made a cake where all come for a second helping. Meanwhile now and then I checked for the recipe and ideas on google, couldn't find who actually created this cake in the first place, I assume definitely not by any food blogger that I know. But saw many recipes and youtube videos which are all similar. In my opinion, someone got inspired by a Mexican Classic moist Three Milk Cake, Pastel de Tres leche that is a basic sponge cake soaked in a mixture of three kinds of milk and topped with whipping cream. 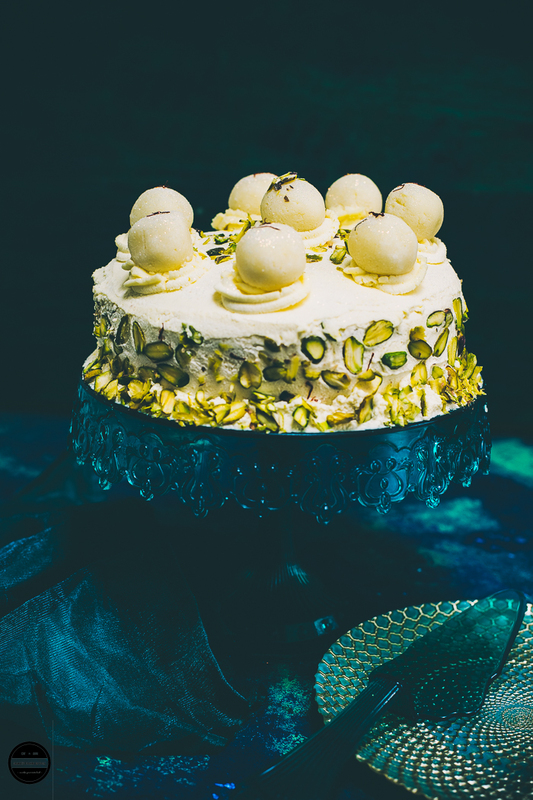 This Ras Malai cake is so similar to that, the basic sponge either with eggs or eggless is moistened with thick milk ( Ras from Ras Malai) which is flavored with cardamom and saffron and frosted with fresh whipped cream and topped with Paneer Balls garnished pistachio slivers and saffron threads. So when the time came, I prepared Ras Malai at home and prepared a Ras Malai cake, did not followed any particular recipe so I am not obliged to give any credit here, but I must say all the recipes and tutorials were really good. The only change I made in this cake that I did not infuse ras malai milk and whipping cream with saffron as I wanted to keep the cake plain white as possible as my daughter's her birthday falls on the same day as Indian Republic Day which is 26th of January. So I wanted to decorate the cake as Indian flag, Orange, White and green. I said my special prayers and prepared cake on 26th as she was coming home on 27th, by the time I finished decorating the cake, the natural light disappeared so couldn't take any picture of it. Next day in the morning I set up all of my props with the cake and just as I was about to click a picture the heavy backboard fell on the cake and just in a matter of seconds my Taj Mahal cake became Leaning Tower of Pisa. I was frustrated almost with anger tears were in my eyes, I did whatever I could do to save this cake, lesson learned when you prepare something delicate like this cake don't muck around but take your time and a lot of care. Luckily, I have a family that appreciates my efforts, who enjoyed this cake fully and daughter said this ' Maa, with this cake, I wish it was my birthday every day'. Don't forget, the Leaning Tower of Pisa is just as beautiful and famous as the Taj Mahal. You can use shop bought ras malai too. This divine and sumptuous Eggless ras malai cake is perfect for any happy occasions. Preheat the oven to gas mark 4, 350 F or 180 C.Butter and flour two 6" or 9" round cake tin. Whisk together yogurt and sugar in a bowl until sugar dissolves properly. Add baking powder and Baking Soda, leave it for few minutes (4-5) to let the yogurt mixture rise. Once it bubbled up, add oil and vanilla extract, mix well and add sifted plain flour and milk powder. Combine everything, add milk little by little and don't beat the mixture too much. Divide evenly between two cake pans and bake about 30-35 minutes ( Eggless cake takes more time to bake ) or until a toothpick comes out clean. Once cakes are done, remove it from the oven and let it cool at room temperature. Once cakes are cooled properly, trim the edges with a serrated knife to even out. Now whip the cream until soft peaks and add icing sugar and cardamom essence. Once again whip for a couple of minutes. ( if you want you can add few spoons of ras malai milk here too) I did not add any. Now start assembling the cake.Spread a little-whipped cream on a cake stand and put the first layer of sponge. Use a spoon and pour thick milk 'RAS' of ras malai. You won't need all of it.Now spread little-whipped cream evenly on the sponge then arrange half of the paneer balls over it.Now apply a thick coat of whipping cream evenly and smooth it with the spatula. Place another slice of sponge cake, pour over ras malai milk and apply a thick coat of whipping cream all over the cake and sides as well. Now frost the cake how you like it using pipings or edible flowers and arrange remaining cheese balls on top of the cake. Sprinkle pistachio slivers all over the cake, garnish it with the saffron threads and sprinkle some edible glitter, especially if you are making this cake for a girl :)Chill this cake for a couple of hours.Enjoy at room temperature. The birthday girl must have been super proud of this wonderful and delectable fusion cake.Not only does it look stunning but its oozing with a mothers love. Thanks Nayna for a lovely comment. Yes, Hayley and whole family really enjoyed it. Such a beautiful cake to bake for your lovely daughter's birthday! I am sure she must have really loved it a lot... 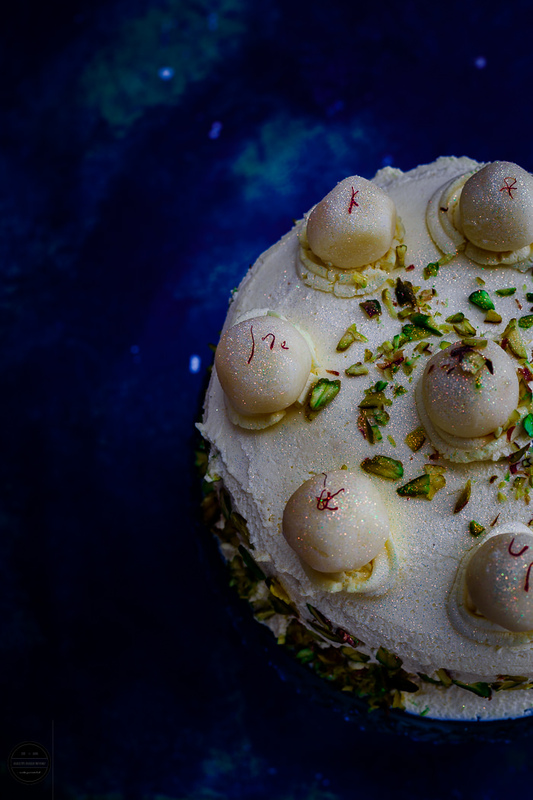 The Rasmalai cake has been doing it's rounds for some time now and definitely, the flavors sound spot on! What a gorgeous cake.. lucky Hayley... Pics are extremely tempting my dear. Wonderful share .. Wow!! Looks so good, I am yet try the Ras malai cake, it was most tried cake recipe. The click is gorgeous. Belated bday wishes to your daughter and this is a mighty achievement from your end by attempting such a delicious looking and moist cake topped with beautiful rasamalais or rosgullas. This cake is perfect for the Indian palate, subtle taste and flavours. Every effort when done with love is greatly appreciated. Glad your family did the same. Cheers! While reading about this ras malai cake I was diving into this flavorful and juicy cake. For a second It felt like I just had a bite of it. I am checking your ras malai version. Clicks are very beautiful. Di make a tutorial for some tips. Such an awesome looking cake.. Wish i could grab a slice right now!! That's a beautiful cake. Loved the combination with rasmalai, it must be tasting yummy. Your daughter mush have been so happy to see this gorgeous cake, You have done this cake so beautifully! Such a gorgeous looking cake with rasmalai. Love the eggless recipe and it is definitely a keeper. Bookmarking the recipe. That is one super gorgeous cake jagruti! Looks amazing! Stunning clicks and I bet the birthday girl must be super duper happy!! This masterpiece looks like hard work!!! love it. Like you I too had seen a lot of rasmalai cakes on social media but haven't dared to make one as I am hopeless at baking. I like that this recipe is eggless so I may attempt to make it one day. You have mentioned milk and milk powder in the cake ingredients but not used in the cake recipe anywhere. Can you plz clear that whether to use milk and milk powder while making the cake or not. I have mentioned in the method when to use milk powder and milk. Please go through recipe once again you will see. Hope this helps.